I have a spending problem. I have been spending above my means for almost as long as I’ve had full time work. I hate how much my financial well-being impacts my mental well-being. Money is just so materialistic, I’d like to think that I’m above it’s impacts on me but unfortunately I’m not that zen. Most of the blame is with me but I can also blame our capitalist/consumerist society for taking advantage of the irrationality of human behaviour. My first goal to help address this issue is to audit my spendings for the month of January, I need to know where my money is going before I can make measures to save. I’m also going to use my employee assistance program benefits to book some counselling around my finances, I have access to 6 sessions a year and this should help me get some goals in place. I’m also thinking of doing a financial education “6 step money makeover” offered by 10 thousand girl in 2016. If you want to see how my audit progresses you can check out my spreadsheet here. My HECS debt is around $50,000, I have a loan for my motorbike and I’m currently paying off my dental work. I want to go on a 5 week holiday to Croatia in September and I want to get weight loss surgery. I think it will take me about 2 years to pay off my credit card debt if I chip away at it every month. I also want to save up for a deposit for some land in Tasmania. You might be curious as to why I’m being so transparent, isn’t talking about salary a taboo subject? I reason that the more I share this the more support I can get and it’s obvious that I can’t do this on my own. Also I’ve already started talking about mental health which is also a taboo subject so the more I talk about these things, the easier it is to get support. 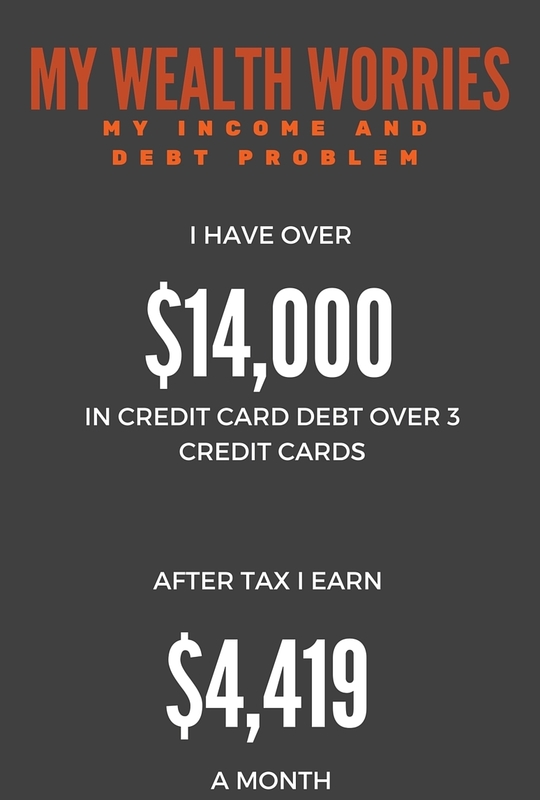 I also don’t think I’m alone with my financial struggles (cool credit card in Australia infograph, credit card debt clock). Anyway, what can you really do with this information? Judge me? You already are doing this. The risk is that I’m opening myself up to a social engineering security attack against my identity, the potential benefit is support working through my problems and maybe helping someone else.